Using smartphones and tablets to monitor or control your automation systems could save a lot of time. Control your JVL motor from IPhone, IPad or smartphone. Integrated stepper and servomotors from JVL with or without wireless interface can now easily be controlled from a smartphone. SCADA software today available for smartphones and tablets can be bought for under €100 and is easy to use and setup. All JVL motors have PLC build in so demanding, time critical application can be solved by the PLC itself and only parameters from main PLC og SCADA are transferred wirelessly. mySCADA is a modern automation system built on open standards which allow the user to deploy mySCADA on any device of his choice, including mobile devices such as iPhones, iPads and Android operated mobile devices. mySCADA Mobile gives you full advantage of unlimited mobility and flexibility within your workspace and even allows you to control your technology sites from anywhere. Supervise your JVL motor and automation system from Tablet or Smartphone. By combining a JVL integrated servomotor or stepper motors with wireless or wired connection it will be possible to read and write to one or more motors at the same time. 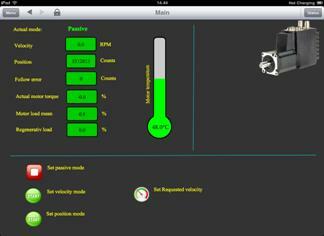 SCADA on IPad will also be possible, so low cost wireless SCADA HMI are now affordable for everybody. It’s an ideal solution for a small-scale project, but can be used on large enterprises as well. There is no limit for the number of JVL motor or PLCs you can connect or views and trends you can use. It’s an ideal standalone solution for small projects such as factory automation, machinery control etc. The concept are based on an App that can be downloaded for under €10 and SCADA PC software are free of charge. If more advanced SCADA function are needed e.g. with more than 1 page can an App for under €100 be downloaded. So a really advanced wireless SCADA HMI solution cost below €100. SCADA HMI using MODBUS communication over ModbusTCP/EthernetIP can control one or multiple motors in a standard office or industrial Ethernet network. Connect your iPad or iPhone to the wireless network via access point or router. Start ”myScada” –app and you are online and can supervise one or more JVL motors on a wired or wireless network . Below is an example that monitor registers in the motor and you can change mode and speed from an IPad. All registers in the motor can be read or written to. and MAC00-EI4 (Ethernet IP ). Read more here. MIS34x with MODBUS TCP e g MIS340C12EMN085. Read more here. MIS34x with Ethernet IP eg MIS340C12EIH385. Read more here. - Manual showing how to setup myScada with JVL motors. For further information please refer to the documentation on the myScada –product.